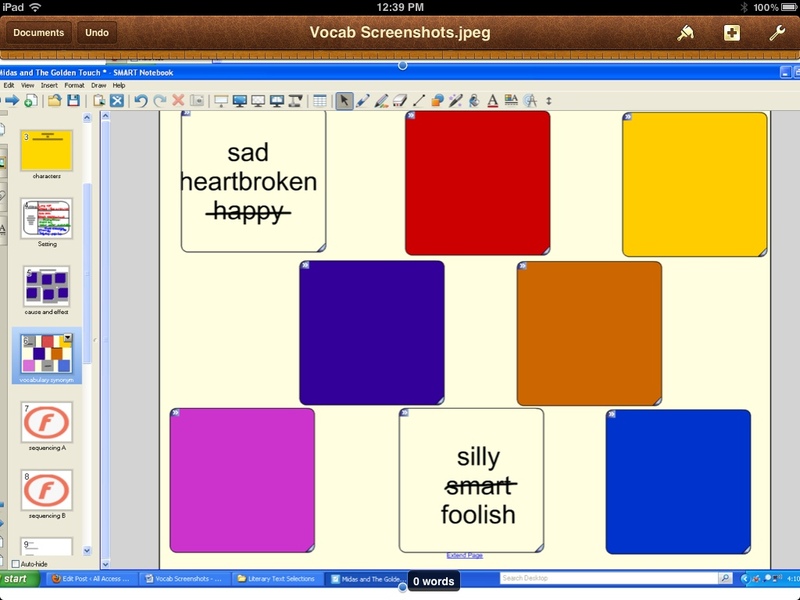 Right now we are working towards increasing vocabulary and improving vocabulary comprehension. 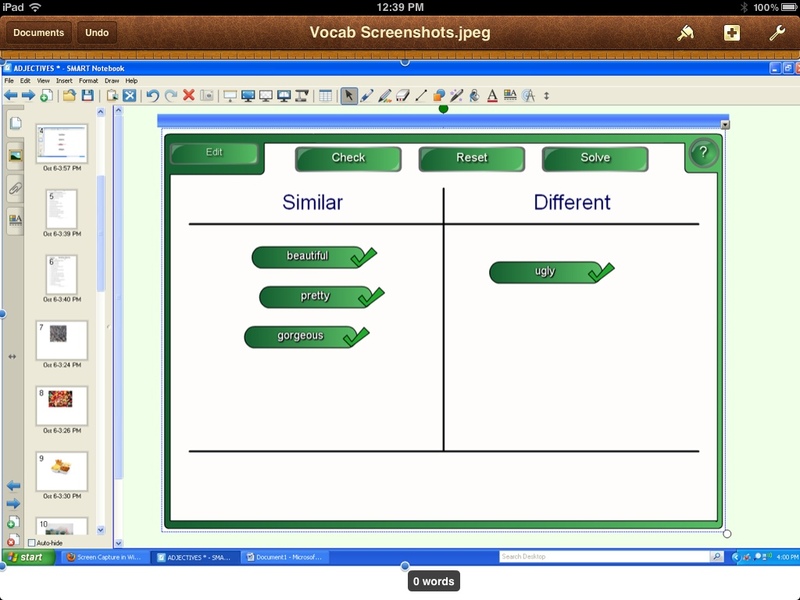 These activities are all variations of the same concept using different formats. Students must find similarities and differences between words in a list. Word Sort (with headings of Same and Different) This would require one page per set of words, but as a presenter once told me, “Pages are free” so it really doesn’t matter if you use 100 pages. 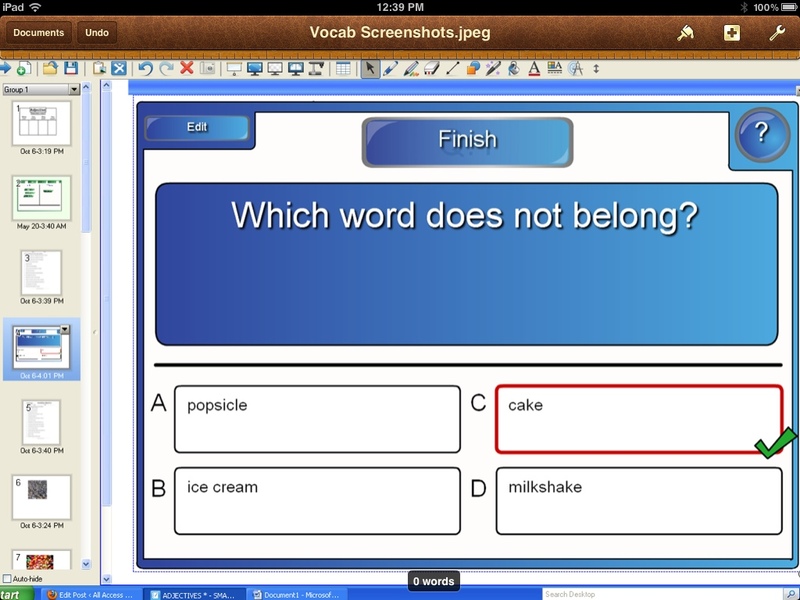 The multiple choice activity works also. You can do up to 10 questions per page. The easiest? I just make lists/groups of words and cover them with the disappearing box. A student reveals a set and then they all use their dry erase boards to write their answers. I let them work in groups for this so they can have some discussion about the meaning of the words. “Clickers” – I wrote a grant for Senteo Interactive Response System a few years ago and using these hand-held devices is the closest I can get to BYOT in my Resource Room this year. The students love using clickers and I am collecting ideas on how to use them to share in a future post. Using index cards, I made a set of cards for each of my round tables. Three cards were similar. One didn’t match up. Students rotated to each table in pairs and had to discuss and write down the words that did not belong. This activity keeps them moving and lets them interact and discuss ideas with classmates. 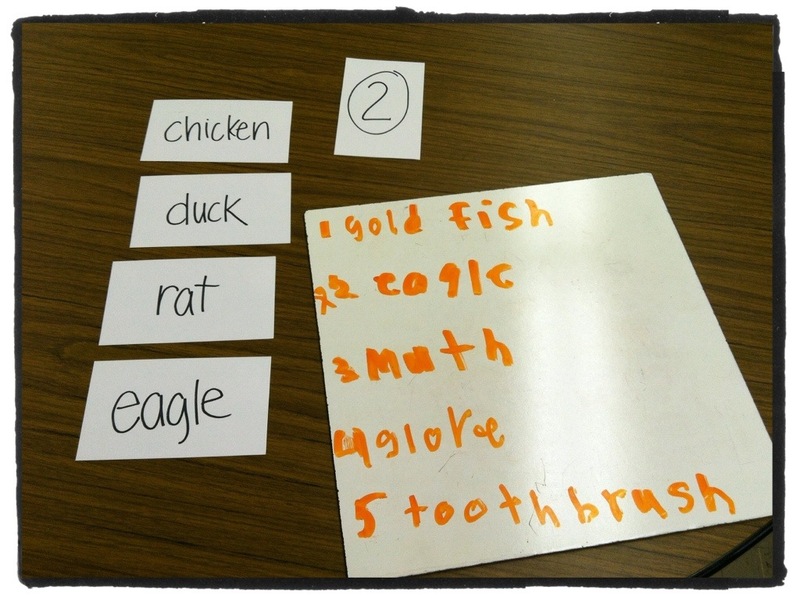 One station in the rotation….I said the answer is “rat” because all the others have wings and feathers. Most of them said “eagle” because the others “walk around on the ground.” Who’s correct? The title of this post made me think of Sesame Street and a popular segment. Who remembers this? I hope you’ll share your ideas on using clickers. I got a set last year, and find them useful for quiz reviews, but I haven’t done a lot of experimenting yet. We have two different kinds, and one is more complicated to use than the other. I have the basic set of clickers. One of our math teachers has a set that allows students to enter numeric values. Do you know you can tag the questions with standards and/or a hierarchy of skills and then sort the results? I just discovered this and plan on using it for IEP data.